This post is sponsored by Philadelphia® Cream Cheese. 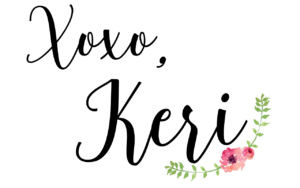 I’m pleased to partner with them to bring you this delicious dessert recipe featuring their products. All opinions are mine alone. Easter is right around the corner and I have just the dessert for you to make for your friends and family! 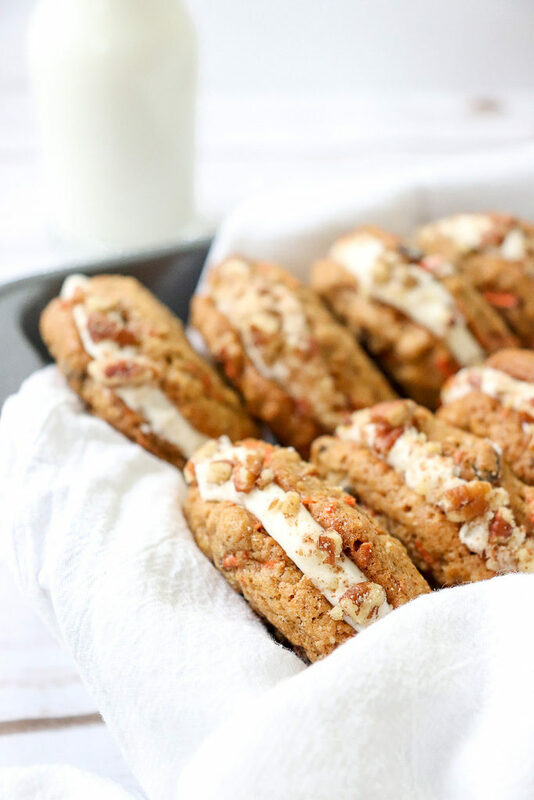 This recipe combines the flavors of a Springtime classic and cookie favorite – Carrot Cake & Oatmeal Cream Pie. Let’s break it down! 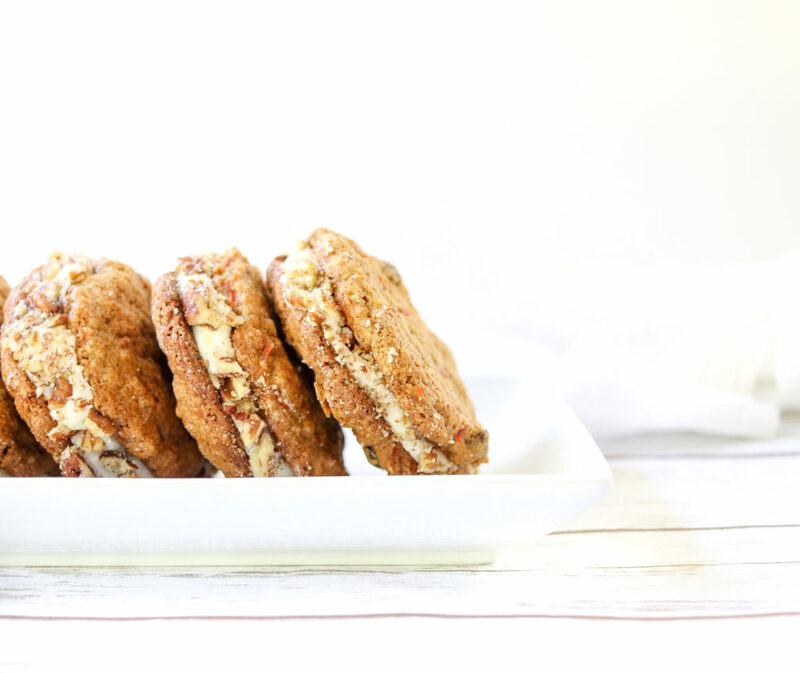 The Carrot Cake Cookies are packed full of flavor from a variety of spices, including: cinnamon, nutmeg and ginger. The oats and raisins are two feature ingredients borrowed from a classic cookie recipe, Oatmeal Raisin. They pair beautifully with the sweet, yet bitter taste of the carrots. In this recipe, I use shredded carrots in which I further chopped into smaller bits. However, I kept them at a size where the carrots are visible in the baked cookies because it adds a fun color for presentation. 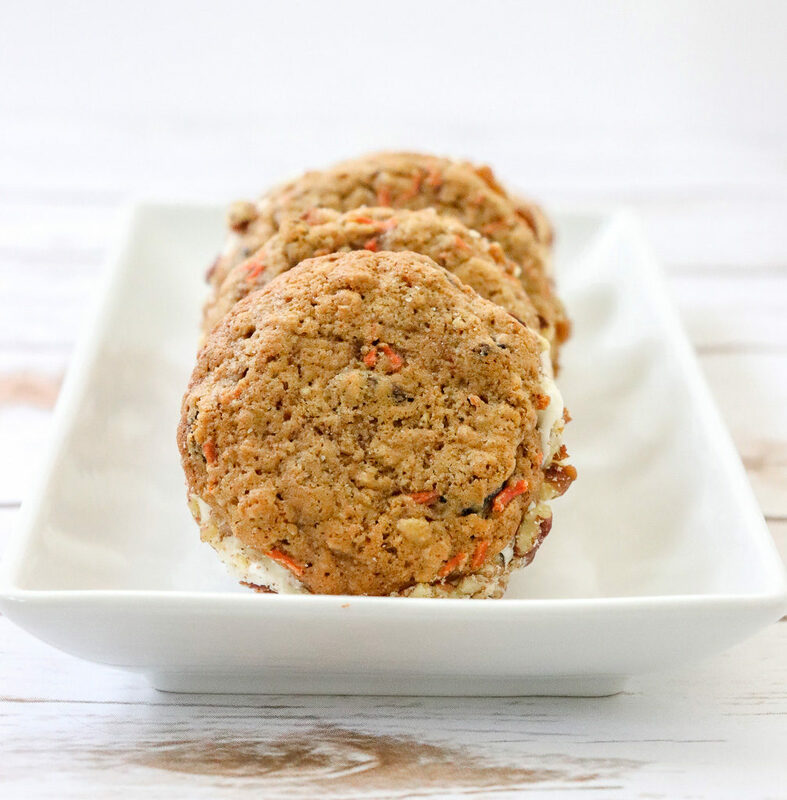 And after all.. this is a CARROT Cake Cookie Recipe! Additionally, this dough is very moist which leads to the cookies staying soft and chewy when baked and assembled. For added texture, I incorporated chopped pecans around the rim. The pecans can be easily traded for walnuts, but you can always leave them out if nuts aren’t your thing. Last but not least, my favorite part of this Carrot Cake Sandwich Cookie.. THE CREAM CHEESE FROSTING! You can’t have a solid sandwich cookie without a thick, creamy and flavorful frosting. Once you try this Cream Cheese Frosting recipe, it will become your new go-to frosting. Not only is it next level in taste and texture, but it is very fast and easy to make, with minimal ingredients. The hero ingredient in this Cream Cheese Frosting is the Philadelphia Cream Cheese. 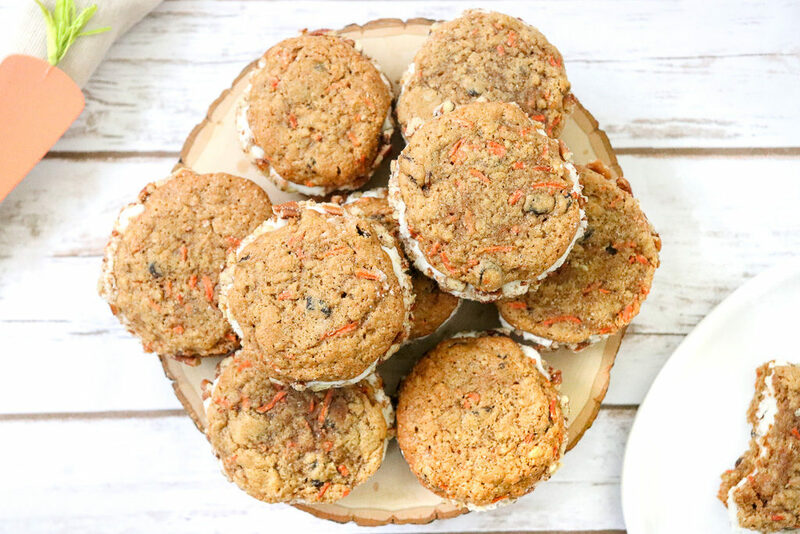 The rich and creamy texture shines through in every bite + the vanilla cream cheese flavor compliments the spices in the carrot cake cookies. Philadelphia Cream Cheese is a baking essential in my kitchen. Bricks are always stocked in the refrigerator. It is the all-embracing ingredient that I base recipes around because there are so many things (both sweet and savory) you can do with it. I used a piping bag to pipe on the Cream Cheese Frosting, but you can easily spread on the frosting with a knife, spatula or other spreading utensil. Philadelphia Cream Cheese packs the perfect taste and texture for your Easter recipe needs! 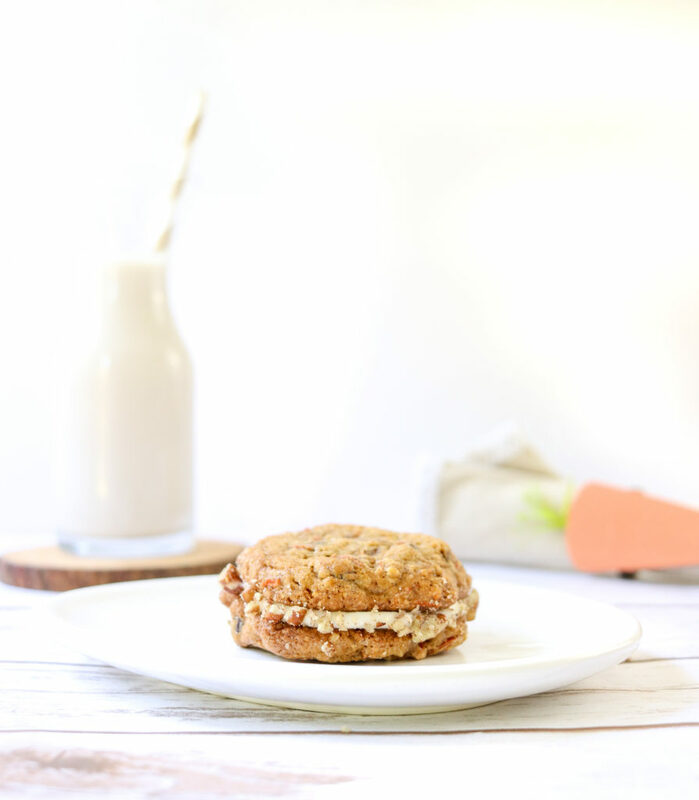 This Carrot Cake Sandwich Cookie with Cream Cheese Frosting is sweet, rich, creamy, delicious and is sure to make your taste buds dance! As we head into Springtime and you begin to plan your upcoming Easter menu, be sure to add this recipe to your list. Don’t forget to pick up a brick or two of Philadelphia Cream Cheese to make the season a bit tastier! In a medium mixing bowl, whisk together flour, rolled oats, baking soda, cinnamon, ginger, nutmeg and salt. Then set aside. Mix egg and pure vanilla extract in until well combined. On lowest setting on stand mixer, slowly mix in the flour/oat mixture until well combined. Then add in carrots and raisins. Cover bowl of dough with plastic wrap, then refrigerate for 60 minutes. When ready to bake, preheat oven to 350 F. Then line baking sheets with parchment paper. With a cookie scoop or hands, roll 2 tablespoons of dough into balls. Then place dough balls onto lined baking sheets. (make sure dough balls are 2 or 3 inches apart with room to spread). Bake 12-13 minutes, then with a spatula slightly pat down the dough to flatten. Bake for an additional 2-3 minutes. Let cool for 3-5 minutes, then transfer to cooling rack. While cooling, in stand mixer, with paddle attachment (or large mixing bowl if using hand mixer) beat softened, unsalted butter (1 stick) and softened Philadelphia Cream Cheese block until well combined. Mix in confectioners’ sugar 1 cup at a time until all 4 cups have been incorporated. Add in pure vanilla extract halfway through adding in confectioners’ sugar. Beat until creamy. 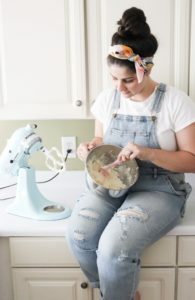 With completely cooled cookies, assemble cookie sandwiches by piping or spreading approximately 3 tablespoons cream cheese frosting in between two cookies. Cream Cheese Frosting will keep in airtight container for 5-7 days. Refrigerate assembled cookie sandwiches for up to 5 days.